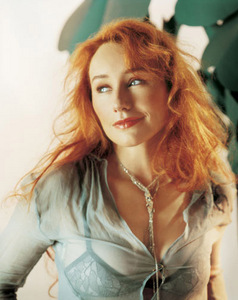 Tori Amos, our duchess of weird pop music, decided to make a fairly contemporary, linear Christmas album with Midwinter Graces. For someone who has so delicately raged against the Christian machine with her lyrics devoted to "it being a girl back in Bethlehem" and "I think the good book is missing some pages," it risked coming off as disingenuous. True, it's not a perfect fit. Flushed altogether, the album is a bit much. She has some lovely arrangements, but it's missing a certain edge. She doesn't rock the manger with any such blasphemy (which would've been fun) and she doesn't even pick any particularly raucous songs outside the big band "Pink and Glitter" (the true win of the album, to be sure). "A Silent Night With You" is Tori's bid for longevity with modern Christmas music and it fits snugly with the "Merry Christmas Darling"s and "All I Want for Christmas Is You" continuum (even if it's nowhere near as cheerful as the latter). Other tracks, such as "Holly, Ivy, and Rose" (featuring Tori's daughter Natashya Hawley on guest vocals), "Star of Wonder," and "Jeanette, Isabella" are among the best tracks, and outside the iTunes Bonus track "Good King Wenceslas," there's not a boring read in the bunch. I just don't see it sticking out in the world for long as there are no real runaway hits on it. It's all just pleasant Starbucks moments.